Formerly known as A&A Arsenal, we are a small family owned and operated LLC that focuses on the sale of military firearms, ammunition, and accessories. We proudly carry the finest products at the best possible prices. In 2012, we set the goal to expand our business and open a brick-n-mortar firearms store in King George, Virginia. 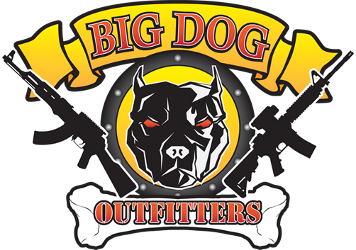 When the opportunity arose, we opened Big Dog Outfitters in the fall of 2012. The primary area of emphasis for the business has been on pre-ban assault rifles, ammunition, and larger caliber platforms although we continue to diversify our inventory as demand evolves and the business grows. In 2013, we expanded our product lines to include hunting, re-loading and other outdoor equipment and firearm accessories/cleaning supplies. Stop in and check us out and if we don't have what you are looking for, ask!! Our business is focused on customers first! We pride ourselves in helping our customers find the right products and we hope to make your experience at Big Dogs an enjoyable one! So, if there is something specific that you are looking for that we don't have in stock, please let us know. If you are not sure what you want to purchase, please ask one of our team members and they can help guide you toward a product that will meet your needs. Thanks for the support and we look forward to continuing to grow our business and family in King George, Virginia. Charles Albert, Owner of Big Dog Outfitters. Charles is a 7 year veteran of the U.S Army, having served in both armor and infantry units. Charles served in tours in both Central America and Southeast Asia and soon thereafter, left the Army and obtained a masters degree in corporate finance. Hired originally by the government to work as an operations officer, Charles spent 10 years as a program manager for the USMC helping develop and field 40mm grenades and other light weapon platforms before leaving government service to open and run Big Dog Outfitters. Kathy Braden - Manager of Big Dog Outfitters. Thomas "Louie" Rodden - Gunsmith and Duracoat/Cerakote Refinisher. Brian Braden - Sales Associate. Candy Simms - ATF Compliance. Clift Sale - Sales Associate. Brian Morris - Sales Associate. Chris Morris - Sales Associate. Tank - Door Greeter and Head of Security. Your friendly neighborhood gun store.